I suppose thanks are due here to a good friend of mine – Grant Eastman. 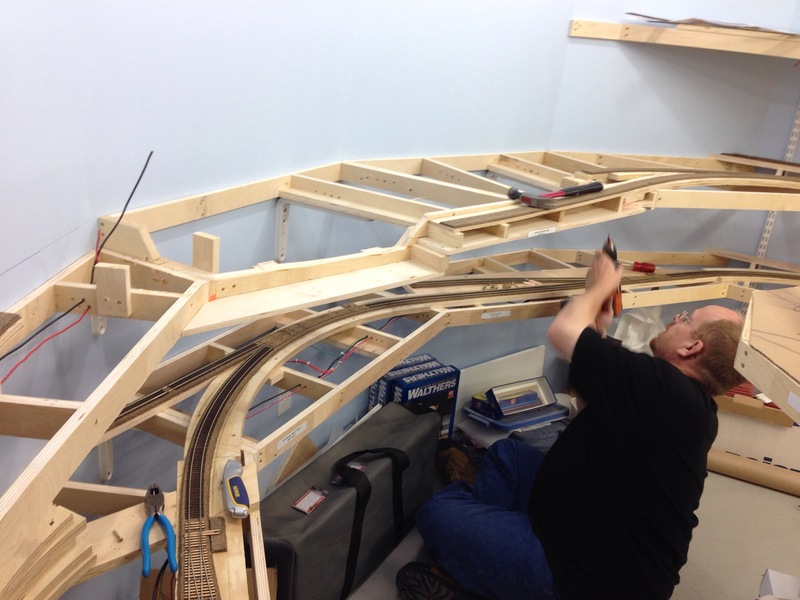 Many times I’ve been to his very impressive N scale layout of the protolanced Southern Alberta Rail, and found substantial sections of benchwork and track completely replaced. He simply didn’t like how it was previously done and decided to do something about it. For example, he didn’t like how one would have to leave the train and walk around the laundry facilities, furnace and hot water tank. So he relocated, not the track, but the latter three items to allow one to stay with the train. 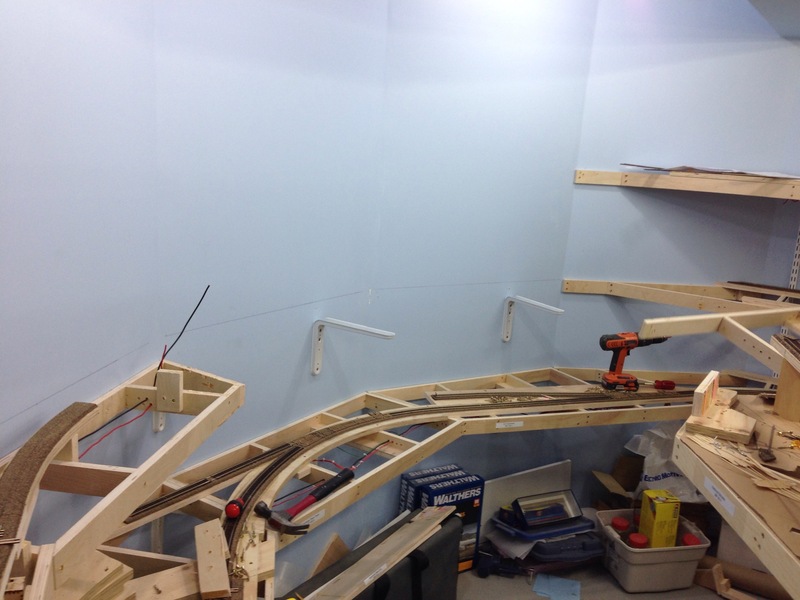 He rebuilt the staging loops and to provide a better track plan, rebuilt the stairway into the basement, changing it’s configuration in the process. He also changed all the code 80 track out with code 55, even in the fully scenicked areas for better appearance. I could go on but you get the idea. Enough about his layout and back to mine. I wanted Vancouver Island Gas to be a signature scene on the layout, but disliked the fact the aisleway around the nose of the basement was tightened up substantially, and that the trestle was right up against said aisleway. 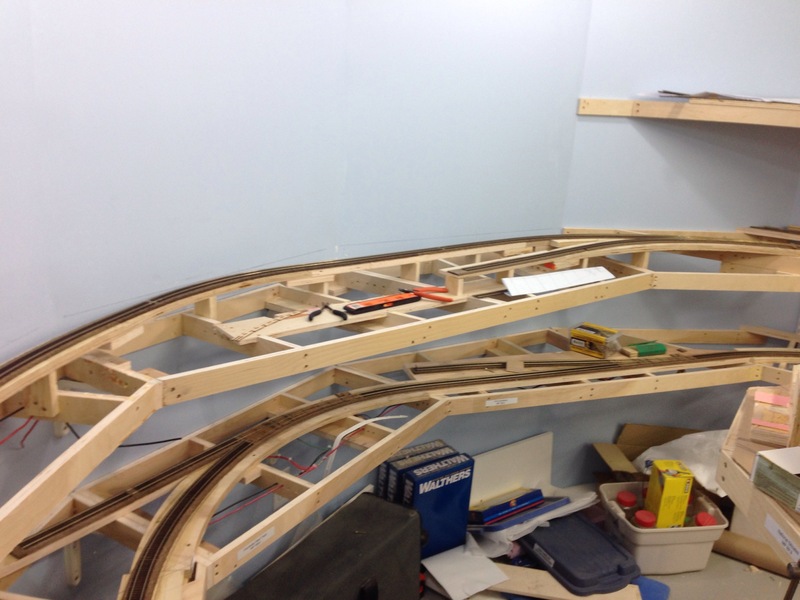 Sure, I could protect the future structure and rolling stock with a sheet of lexan (high-grade plexiglas) but it did nothing to reduce the amount of dead space behind the track that would need scenicking. So, after consultation with Cam and Dan, I decided to follow Grant’s lead and do something about it. Track was lifted, feeders cut, bus wiring separated, benchwork pried apart and then removed. Here’s a couple shots of the work in progress. The first shows Cam undoing screws to take off the benchwork and the next after everything save for the brackets have been removed. Sadly, I neglected to take a ‘before’ picture as we jumped right into the work. Some people showed considerable concern over the fact I was in demolition mode before the layout was even complete, but after reassuring them with why, they were supportive. The aisleway gained enough width (give or take another 7 inches), the space behind the track was substantially reduced and there’s space in front of the spur. Sadly, one consequence of the work is the loss of the needed height to properly model the trestle. It’ll end up being compressed in both directions, but I couldn’t achieve that height without really impacting the space below. Oh well. I’m still happy I did this. This entry was posted on September 5, 2014. 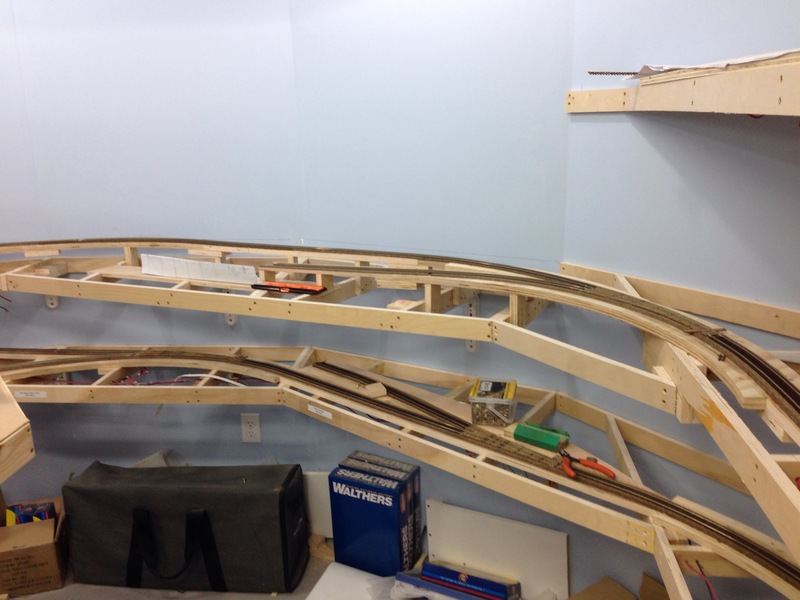 It was filed under Benchwork, Trackwork, Wiring.